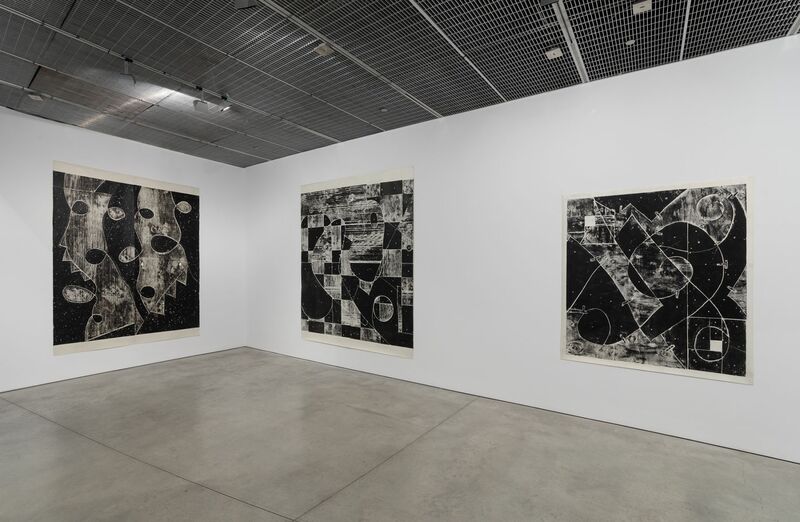 David Nolan Gallery is proud to present Mel Kendrick: Woodblock Drawings, an exhibition centering around Kendrick’s large-scale works on paper, created from 1992 to 1993.Six monumental woodblock drawings (the largest of which have never been shown in New York) will be presented along with a single contemporaneous freestanding work from a series that the artist refers to as “black-oil sculptures.” A fully illustrated 128 page book produced by Black Dog Publishing, featuring a newly commissioned essay by Mark Pascale, the Janet and Craig Duchossois Curator of Prints and Drawings at The Art Institute of Chicago, will be available during the exhibition. Unique and impressive for their sheer scale and range of visual styles, the exhibition examines a defining body of work in the artist’s career. 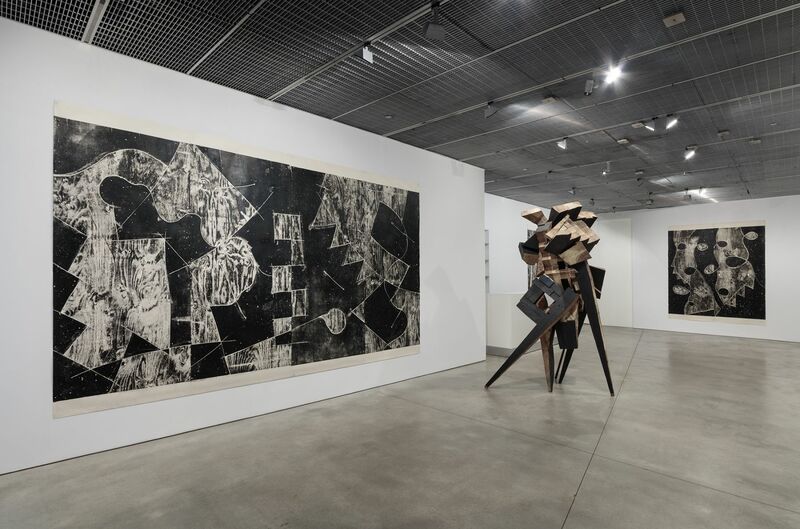 First shown at John Weber Gallery in 1993, the drawings may have seemed like a radical departure for an artist known principally as a sculptor, and admired for his work in wood. 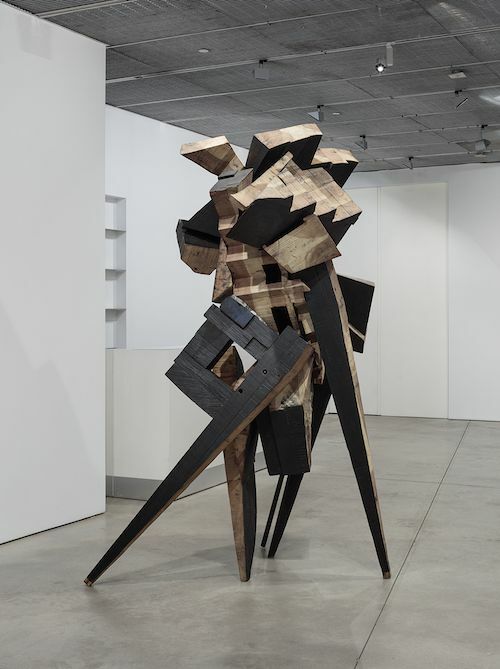 The works nevertheless draw upon and extend concepts within Kendrick’s rigorous process-oriented practice, and – significantly – use wood grain as their primary element. 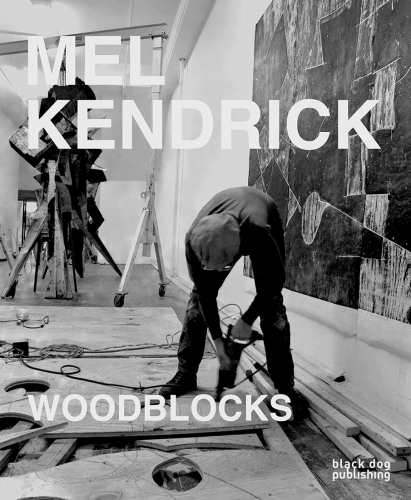 Since arriving in New York in 1971, Mel Kendrick has exhibited nationally and internationally. His work may be found in the collections of numerous public institutions including the High Museum of Art, Atlanta; The Baltimore Museum of Art; The Art Institute of Chicago; Dallas Museum of Art; Nasher Museum of Art at Duke University, Durham, North Carolina; The Museum of Fine Arts, Houston; Minneapolis Institute of Art; Walker Art Center, Minneapolis; Yale University Art Gallery, New Haven; Brooklyn Museum, New York; The Metropolitan Museum of Art, New York; Whitney Museum of American Art, New York; Philadelphia Museum of Art; Saint Louis Art Museum; National Gallery of Art, Washington, D.C.; and Parrish Art Museum, Water Mill, New York. Kendrick lives and works in New York. 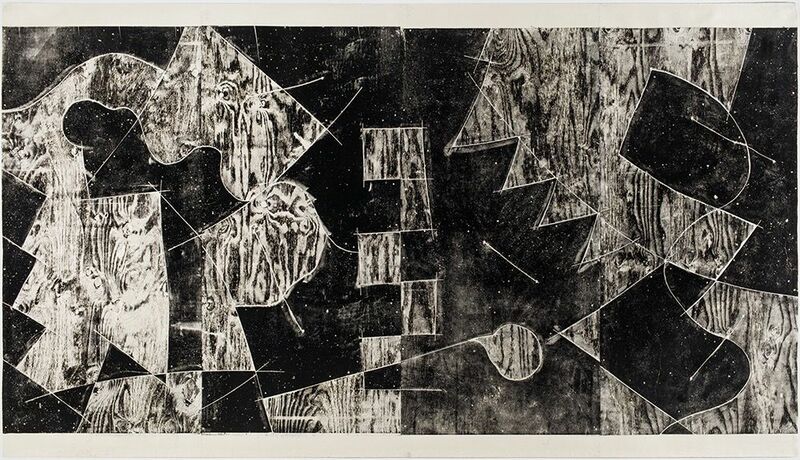 The New York sculptor’s memorable black-and-white woodblock prints, which he made in the early nineties, suggest pages of closely set type—if those pages were nine feet tall and seventeen feet wide. The interplay of chalky woodgrain patterns and speckled blacks is enlivened by sharp white lines, notably in “10 Loops 3,” in which two long, serrated shapes descend against a dark background. Anchoring the half-dozen prints is Kendrick’s jaggedly energetic “Black-Oil Sculpture No. 4,” a poplar construction darkened with lampblack—a dramatic drawing in three dimensions. 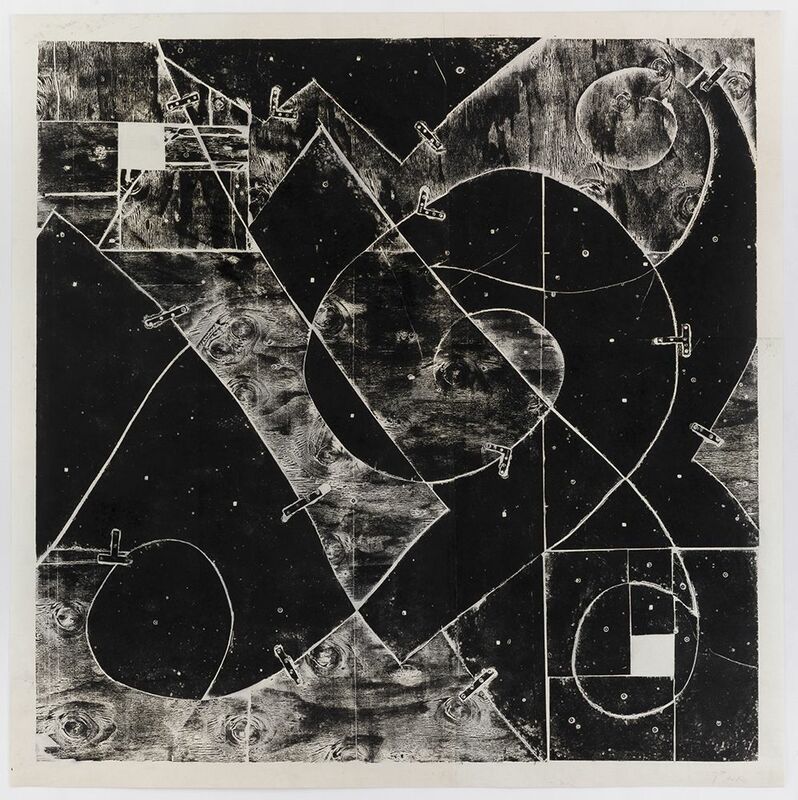 Mel Kendrick has staked his career on exploring the positive and the negative in drawing, printmaking, photography, and sculpture. 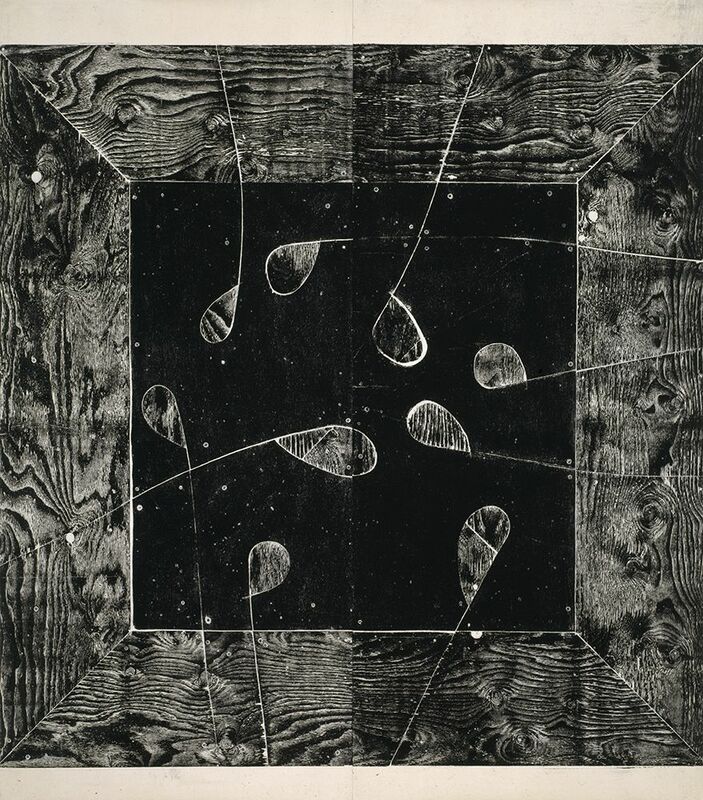 With the eye of a photographic plate, he finds the black in the white, the projection in the emulsion, the print in the press, and the shape in the void. Most known for his sculptures carved out of blocks that form their own pedestals, Kendrick has a varied studio practice that may find his stamps turned into sculptures turned into photographs, all in a flipping, tumbling performance of process and materials. 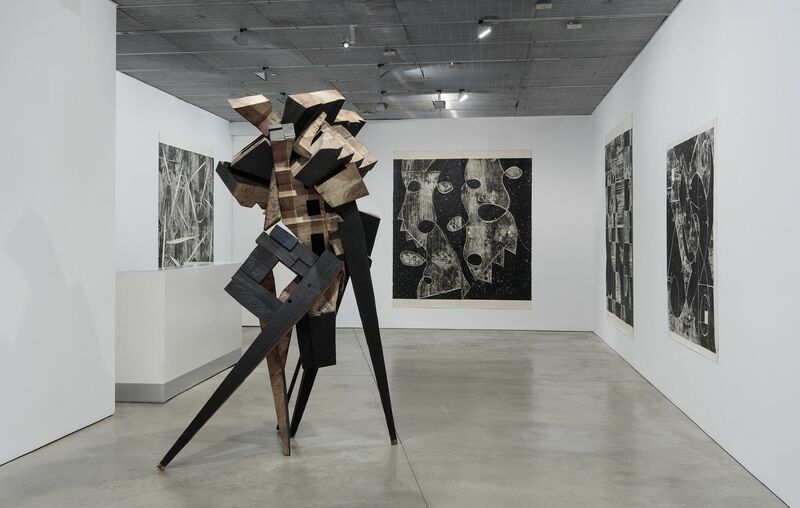 Now at Chelsea's David Nolan Gallery, "Mel Kendrick: Woodblock Drawings" reassembles a series of large-scale woodblock prints created in 1992 and 1993 along with a single spidery wooden construction. 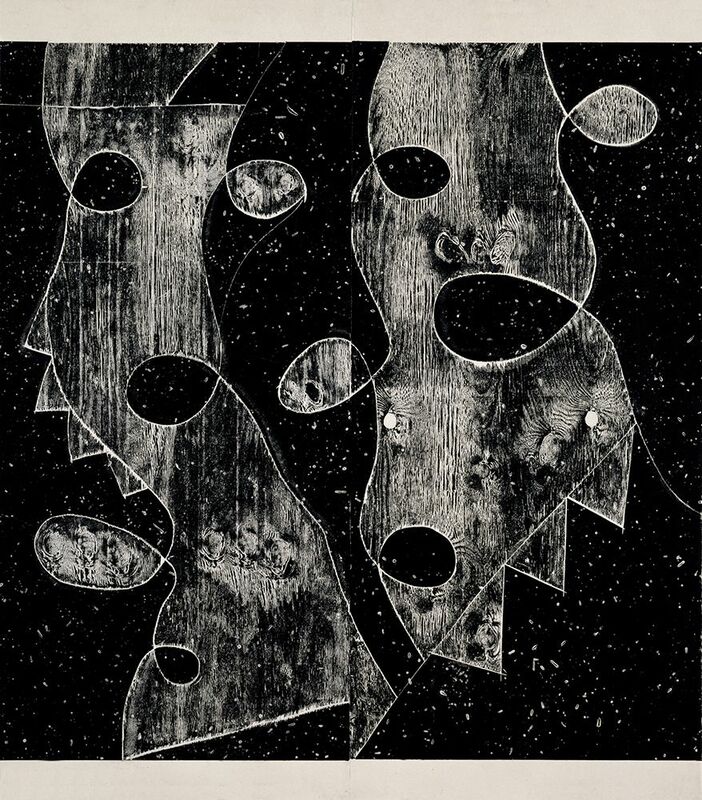 What from far away resemble surrealist drawings are revealed, upon closer inspection, to be enormous paper sheets printed with equally enormous plywood stamps. Closer still and the manufacturing of these stamped objects becomes apparent, with the swirling jigsaw cuts and metal hardware, down to the Phillips-head screws, that must have held the stamps together. 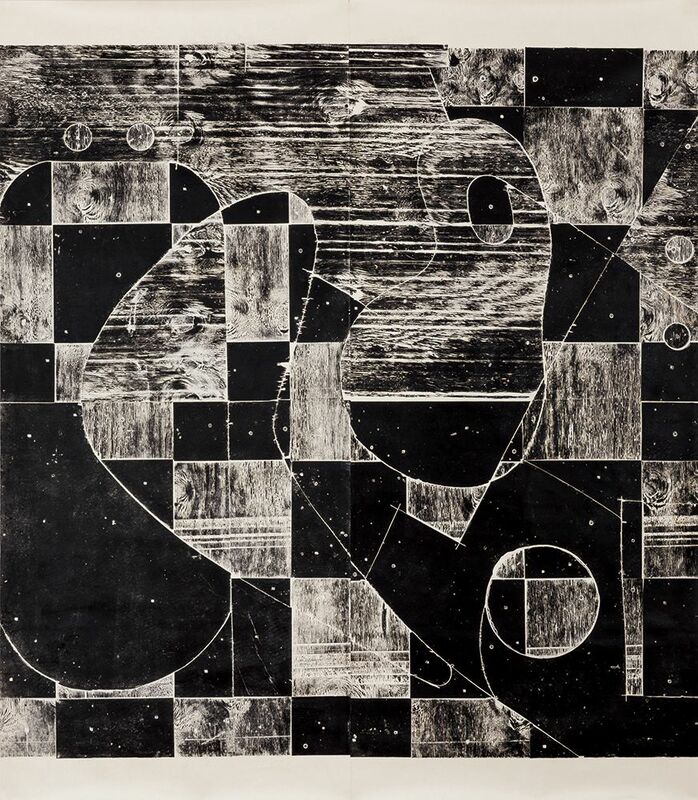 In the paper print of this wooden matrix, cuts become lines and woodgrain becomes shading, with the wood's textural variations now transformed into the stark contrast of a black print on white paper. 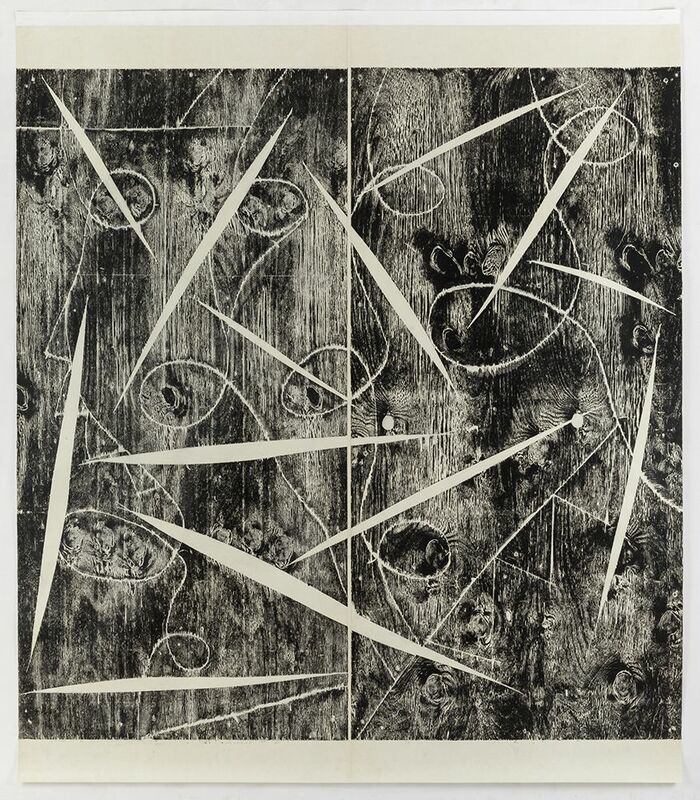 Kendrick calls these prints "drawings:' and in the silky lines of the woodgrain they draw out a startling impression. 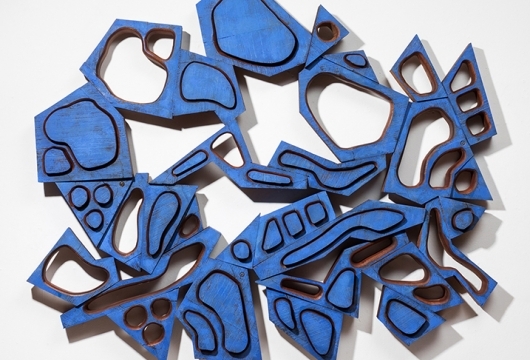 "Mel Kendrick: Woodblock Drawings" opened at David Nolan Gallery, New York, on September 7 and remains on view through October 28, 2017. That's art, not just process. It's a hard truth that most of the artists who emerged from the late-1970s process-art scene never really evolved. A wonderful exception is Mel Kendrick, 68, who is still all process, all the time, but whose monumental gray-black jig-saw-like renderings made into drawings come on like claps of optical thunder with lingering intellectual reverberations.